Verderflex Peristaltic Pumps can be used in many different business sectors and for a variety of industry applications, including mining, chemical processing, food procedssing, printing and packaging, waste management and water management. These pumps are ideal for either intermittent or continuous use, are simple to control and easy to use. Importantly they are an extremely reliable, made-to-last, flexible way to pump liquids. Businesses use these pumps in a range of applications from the food and beverage, to water purification, biofuel production, and beyond. 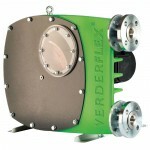 The challenge of pumping sludge into digestion tanks in a plant manufacturing biofuel was given to Verderflex pumps. These pumps are perfect for producing the high suction lift required and can easily transfer sludge with high % solid content. Six model VF125 pumps, selected on the basis of previous performance, are being used at the world’s largest platinum concentrator in South Africa, to pump a chrome and platinum slurry with 1.8 Specific Gravity and between 60% and 80% solids. A waste incineration plant in Suzhou, China is now using 12 Verderflex peristaltic plumps as part of their leachate process and injection system. The pumps are used to move the leachate from the collection reservoir to a draining reservoir, and at the same time, send it through an automatic cleaning filter. Water sterilization is critically dependent on the appropriate dosing of hypochlorite. In South Africa, three model Dura 25 peristaltic pumps with PP flanges have replaced diaphragm pumps that were prone to vapour lock. After sterilization, this water is supplied to one of Johannesburg's largest informal settlements. Titanium condensation tubes are protected by an iron coating deposited from a liquid containing ferrous sulphate (FeSO4) solution. Solid ferrous sulphate, in the form of Copperas crystals is mixed to form this liquid and re-circulated and dosed by a Dura 15. Diatomaceous earth (kieselguhr), a key component of the filtration process for beer in a Bavarian brewery is dosed into the process by several Dura 25 pumps and subsequently used in filtering 1200 hl of beer per filtration cycle (~8 to 10 hours). AODD pumps were exchanged for Dura 15 pumps when water based inks were introduced into the production line. The AODD pumps were experiencing foaming problems, resulting in bubbles in the ink, which the peristaltic nature of the DURA 15s completely eliminated by their mild pumping action. When it was found that manual UV inkbottle refilling was not economically viable, a digital photo processing plant undertook a study using stand-alone Rapide R3S and R17 peristaltic pump driven filling stations. After this successful pilot the company had several purpose built filling stations designed, each using four, two channel R17S pumps. Imbalanced pressure in a chamber filter press system can occur as a result of fluid injection. Verderflex hose pumps, with their comprehensive range of accessories, guarantee easily controlled operation. Liquid polymer dosage into sludge requires accurate and precise measurement during all stages of separation and dehydration. Verderflex VF and Dura hose pump dosage of fluids is accurate and precise, even at high pressure and without shear. Treatment of wastewater with lime milk and potable water with activated charcoal are both essential steps in water treatment. Verderflex peristaltic pumps are highly efficient and reliable, thereby reducing maintenance costs, without compromising performance.